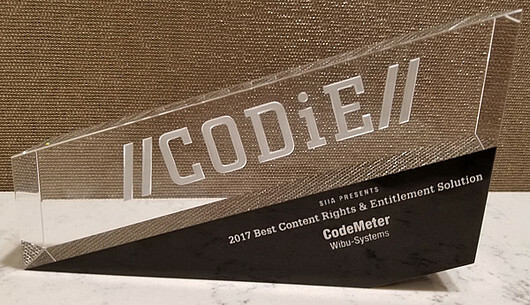 CodeMeter takes top honor at the 2017 CODiE Awards for Business Technology Industry in the Best Content Rights and Entitlement Solution category. Wibu-Systems, the world leader in software monetization for independent software vendors and intelligent device manufacturers, announced today that CodeMeter has been named the Best Content Rights and Entitlement Solution of 2017 in the 32nd annual SIIA CODiE Awards. CODiE Award recipients represent the companies producing the most innovative businesses technology products around the world. CodeMeter is a business-enabling secure licensing platform that protects the intellectual property of software vendors against piracy and reverse engineering, provides versatile, price-responsive business models that meet even the widest array of customers’ requirements, and easily allows for the integration of endpoint security features into Industrie 4.0 frameworks. With the strongest and most innovative encryption methods, a dynamic license lifecycle and entitlement management, and a customizable footprint that adjusts to the specifications of the target system, CodeMeter is maintaining its uniqueness in the global market. “SIIA’s 2017 Business Technology CODiE Awards recognize the companies that are at the forefront of business innovation. These companies are shaping the future of how we conduct business, and it is truly an honor to recognize these products through the CODiE Awards”, said Ken Wasch, President, SIIA. The Software & Information Industry Association (SIIA), the principal trade association for the software and digital content industries, announced the full slate of CODiE winners during a special Award Ceremony in San Francisco on July 25. The SIIA CODiE Awards are the industry's only peer-reviewed awards program. The first-round review of all nominees is conducted by software and business technology experts with considerable industry expertise, including members of the industry, analysts, media, bloggers, bankers and investors. The scores from the expert judge review determine the finalists. SIIA members then vote on the finalist products, and the scores from both rounds are tabulated to select the winners. 60 awards were given this year for products and services developed specifically for B2B software, information and media companies. Details about the winning products can be found at http://www.siia.net/codie/2017-Winners.